Does Your Next House Have The Power You Need? 1) Expired smoke alarms! There is a good chance that the smoke alarms in your next home are expired and will need to be replaced. Smoke alarms expire after 8 years and have a manufacture date on the backside of the alarm. Expired smoke alarms are a commonly missed hazard on a routine home inspection report. 2) Appliances, Appliances, Appliances! Don’t assume your home inspector knows what your future plans are! If you are bringing appliances from your old house to your next house or purchasing new appliances, you need to verify your electrical requirements and make sure you are not trying to fit a square peg into a round hole. You may need to have an electrician install a new circuit or change out a cord or a plug so you can safely use the appliance. Tip: If you are moving into a condominium and want new appliances, you need to know if your electrical service is 208 volt or 240 volt before you purchase your new appliances! This could save you tons of trouble! 3) If your future plans include adding a hot tub, electric range, electric dryer, air conditioning, pool, electric car charging station or an electric water heater; you may need to budget for upgrading your entire electrical service from 100 amp to a 200 amp service. Upgrading your electrical service can cost anywhere from $2,000 -$4,000 in addition to the cost of installing wiring to the new appliance. deck on your new home, beware of the power lines! 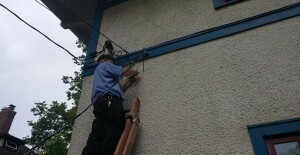 Our electricians can install and repair all of the electrical needs in your new home. If you have questions about the electrical capabilities in your house, give us a call, we’d be happy to chat with you and assist in any way we can! 612-385-7864.